So why is it good and fun to plant herbs at home? For some it might be pure fun, but there are more healthy reasons why people do this. It not only looks nice, but it also lengthens your life, experts say. It will be easy to incorporate some of the herbs in your dishes and you will cut down on expenses for them. They will always be ready and fresh for you – just the right amount you need to heal your body. You certainly love to look at this flower and even decorate your home with it every once in a while. Stop using it only for decoration, for this flower is so much worth for a healthy living style. Chamomile has been used in traditional medicine as a healer for centuries now. The most known usage and the most favorite one, I must admit, is the one connected to daily stress. We all live with it – stress is a big part of our lives. But there is a natural way to relieve it from the comfort of your lovely home. Chamomile tea is great for treating insomnia, stress, and anxiety as well. The tea will instantly bring a relaxation mood for you and your family, especially if you have it in your home garden. Out of the many health benefits that chamomile has, we will mention just a few. Chamomile works well for the upset stomach, treats nausea and even heartburn. Moreover, it can be helpful if you suffer from diarrhea or hemorrhoids, it can heal your wounds and make you suffer less if you have a skin irritation. You just need to apply it to your skin and say goodbye to the torture! Whether you’d known it from the famous pesto sauce, or you just remember its magical and fragrant smell, basil is a unique herb. 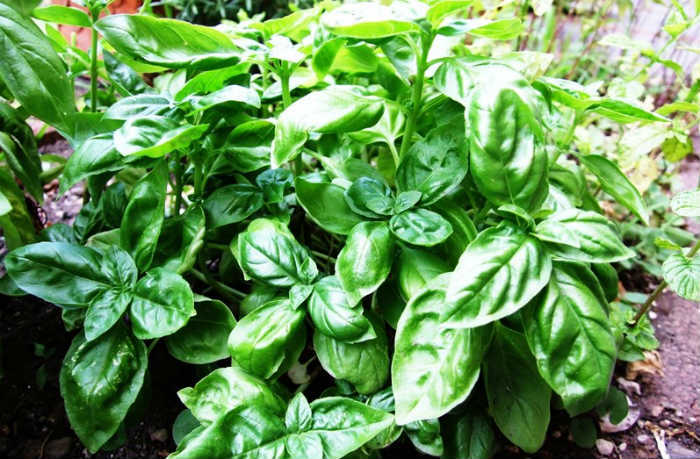 Basil originates from India and Iran. It probably became popular because of the pesto sauce, which besides basil contains parmesan cheese and pine nuts. For those who didn’t fall for its beautiful smell, we have some wonderful news. Basil is great for your health! It protects your body in two main ways: with its volatile oils and its flavonoids. Studies have shown that these flavonoids protect the cells in the body. There are two types of flavonoids and they are called vicenin and prientin. These are water-soluble and studies have proven that they protect the cells structures and the chromosomes against damages based on oxygen and against radiation. Basically, basil can stop bacterial growth. A compound in the volatile oils called eugenol helps to block an enzyme called cycloxygenase, which is inhibited by most over-the-counter drugs. Interestingly, basil can help in treating rheumatoid arthritis, treat indigestion, help the sore throat and the severe cough, reduce swelling, and even ease the headache. This herb is famously known in the beauty industry for healing the skin. However, it can also be useful in curing many health conditions. What we know about Aloe Vera from history is that it can be traced back to 6,000 years ago in Egypt, where it was used by Egyptians in traditional medicine. People used it most frequently to treat their skin issues and wounds. Aloe Vera was scientifically proven to heal the digestive system. This was published by the British Journal of General Practice. The journal also stated that Aloe can heal the stomach ulcers and decrease irritation. Because of the anti-inflammatory properties of its juices, it can also treat the irritable bowel syndrome and colitis. Additionally, Aloe can help in the treatment of diseases such as diabetes, epilepsy, psoriasis, and asthma. Or you can just use Aloe as a food flavoring. – Always grow Aloe in big containers and don’t expose it directly to the sunlight. If you please, you can also use artificial light. – You need to water it deeply and allow the soil to dry for two inches between watering in order to prevent rot. Start now! Do not hesitate to bring these health wonders in your home!